The making of special tools required in both clockmaking and repairing is a part of the job and you really cannot progress very far if you are not prepared to undertake this work. Many of the tools described in this book are obtainable commercially today although they weren't when I first started. Many operations cannot be performed satisfactorily unless the proper tool for the job is used. For example it is both difficult and dangerous to insert and remove powerful mainsprings from their barrels without the use of a mainspring winder. Although these tools are commercially available, the newcomer will gain valuable experience in the use of his lathe by making this item. 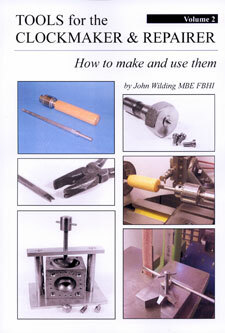 The belt sander is a most useful tool to the clockmaker but to obtain the full value of this machine a number of jigs and fixtures will have to be made and these are described in this book. It is not possible to purchase Jacot drum attachments for the modern lathes, but this attachment is essential for the repair of pivots and a full description is given of a design suitable for the Unimat 3 lathe. 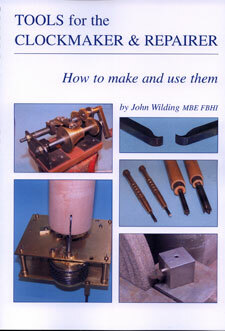 In Volume one of this series I described a number of tools essential for the repair and making of clocks. Over the years I have collected more of these tools which are now depicted here in this second volume of " Tools for the Clockmaker".